John Backus, the inventor of Fortran criticized the defects of von Neumann languages (aka, imperative languages) in his 1977 Turing Award Lecture. Most of his points still remain valid until today! He described conventional programming languages as fat and flabby because each successive programming language adds more and more features with little cleaning up. Even though most conventional languages are similar as they simply add higher level constructs to the same underlying von Neumann computing model, learning a new language still takes long time due to many subtle corner cases in their semantics. What’s the von Neumann computer? It has three parts: CPU, a store and a connecting tube that can transmit a single word between the CPU and the store. Programming on this machine is to change the contents of the store by repeatedly transferring single words between CPU and the store through the tube. So he called this tube the von Neumann bottleneck. By the von Neumann bottleneck, he does not mean the limited bandwidth of the tunnel (bus). The real problem is that it becomes an intellectual bottleneck that keeps us tied to word-at-a-time thinking instead of larger conceptual thinking. The assignment statement in von Neumann languages corresponds to the von Neumann bottleneck which keeps us thinking in word-at-a-time terms in much the same way the computer’s bottleneck does. So he proposed Functional Programming (FP) system as an alternative to von Neumann languages. FP is a functional programming language in point-free style. Please read the original paper for the details of the language. If you are interested in the implementation of FP, FP is my Haksell implementation of FP. Page change gesture is a bit annoying to me because I often accidentally change pages when I just wanted to scroll up and down. Because Google Chrome uses Apple’s default gestures, we can turn it off from System Preferences. Xcode 5 supplies clang as the C compier, and with respect to pre-processing there are some “differences of interpretation” between it and gcc. These differences can affect some Haskell code that uses the CPP extension. Download ghc-clang-wrapper. Copy this script to /usr/bin, and make sure it is exectuable. Run it sudo. Install a gcc and direct GHC at that. Yesterday I joined the Free Software Foundation Associate membership, so I donate $10 per month now. I think $10/month is a small money compared to the value and freedom I got from many free software I’ve always used. If you purchase many silly apps on App Store and Google Play and never donate any money to the free software you use everyday, you should feel shame on you. Free software is a cornerstone of any modern free society. Please help build this foundation. I’ve just got back to Korea from WebKitGTK+ Hackfest. 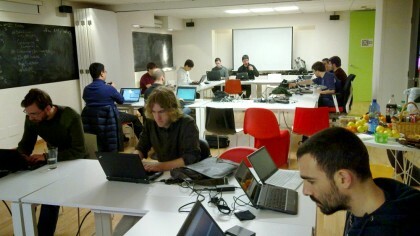 The fifth WebKitGTK+ Hackfest was held in A Coruña, Spain December 9-12. I attended the hackfest for the first time and really enjoyed hacking thanks to many excellent hackers from Igalia, Collabora, Samsung RedHat and CableLabs. I helped enabling network process for WebKitGTK+ with Andy Wingo, Carlos Garcia Campos, Gustavo Noronha, Brian Holt, Martin Robinson, Alberto Garcia and Sergio Villar. Enabling network process was a top priority because it is a prerequisite to support a one process per tab (multiple web process model). And we succeeded. WebKitGTK+ now supports multiple web process model with a nice bonus of network process though we still have lots of issues and bugs to fix. For more details on the work, refer to Carlos’s excellent summary: WebKitGTK+ Hackfest 2013: The Network Process. Big thanks to Igalia and GNOME foundation for hosting this great event!